Usually I am not into anything RAW, especially near my mouth. As they say there is an exception to every rule and I have found mine. Obsessive Compulsive Cosmetics Lip Tar brings new meaning to Tar Tar…well at least it does for me. 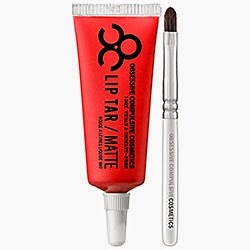 Inline with the RAWness of Tar Tar, OCC's Lip Tar, like the rest of their products, is petroleum and silicone free. Unlike the Tar Tar that you see on fancy steak house menus, these babies are 100% Vegan and cruelty free. Whether I'm eating a steak or a vegan friendly meal, these lippies will be laced with TAR!